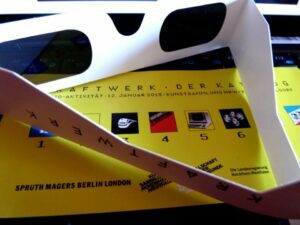 KRAFTWERK played an emotional second show as part of their ‘Der Katalog 1 2 3 4 5 6 7 8’ residency at Die Kunstsammlung Nordrhein-Westfalen to an expectant hometown crowd which included PROPAGANDA’s Ralf Dörper and members of DIE KRUPPS. Most of their Düsseldorf shows sold out within 10 minutes. And for those who were lucky enough to get their names on the list tonight, Ralf Hütter, Fritz Hilpert (now celebrating his 21st year with KRAFTWERK), Henning Schmitz and new live video technician Falk Grieffenhagen delivered the ‘Radio-Aktivität’ album in full along with other KRAFTWERK favourites in a comprehensive retrospective set. 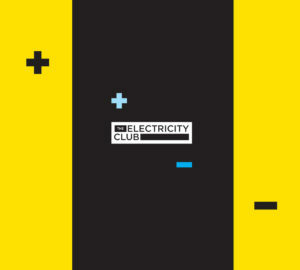 The Electricity Club’s on-location witness said: “It was a breathtaking moment for a synth music lover like me who was much too young to see them in the earlier days. This was the place to be. It was exactly two hours of synth and 3D joy which started with ‘Die Roboter’. They brought us ‘Radioactivity’ with a tribute to the people of Fukushima, took us on the ‘Autobahn’ in a VW Beetle and rode the ‘Trans Europa Express’ with ‘Das Modell’ and ‘Die Mensch-Maschine’. Via La ‘Tour De France’, they provided with some ‘Vitamin’ pills as well. It was a fantastic gig tonight”. The ‘Radio-Activity’ album (as it is known in the UK and US) has a special resonance with The Electricity Club as its title track inspired the song from which this website gets its name. OMD’s ‘Electricity’ was written by Andy McCluskey and Paul Humphreys as a homage to KRAFTWERK and is basically the title composition speeded-up! 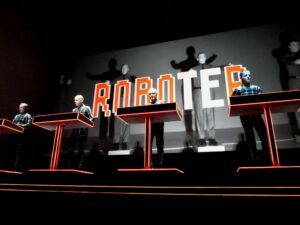 It was also the first album to feature the classic line-up of Ralf Hütter, Florian Schneider, Wolfgang Flür and Karl Bartos, names which have gone down in folklore as the godfathers of modern electronic pop music… indeed OMD did another KRAFTWERK tribute entitled ‘RFWK’ for their 2010 comeback album ‘History Of Modern’ and Andy McCluskey described the two combos first personal encounter back in 1981 at the Zeche Club in Bochum as “like meeting your parents”! 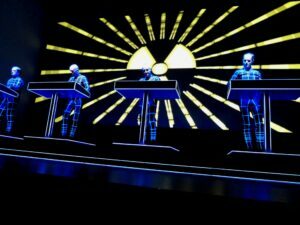 ‘Radio-Activity’ is also significant as it was KRAFTWERK’s first album with English lyrics and it was their first achieved by wholly electronic means. ‘Autobahn’ may have been the breakthrough LP but that featured guitar, violin and flute! 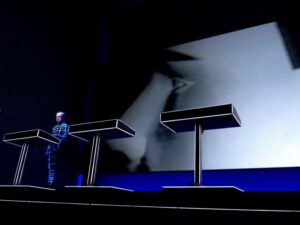 KRAFTWERK’s fifth album saw the debut of a then-new keyboard contraption, the Vako Orchestron which amplified sounds pre-recorded on optical discs instead of tapes like with the Mellotron. Creating the shimmering choir and string textures that were to become the retro-futuristic blueprint of acts such as OMD, ULTRAVOX and NEW ORDER, the Vako Orchestron complimented Kling Klang’s existing arsenal of Minimoog, ARP Odyssey, EMS Synthi A, Vocoder, Votrax, Farfisa Rhythm 10 and customised electronic percussion kits. The concept had originally been themed around radio activity as in broadcasting as opposed to nuclear physics; the hyphen had been added to illustrate the point. But the band courted controversy on the album’s release with a series of promotional photos in atomic power stations. Their ambiguity with regards the politics of this sensitive issue angered the strong Green lobby in Germany and may have even contributed to their lack of popularity at the time in their home country. The romantic overtones, melodic synthpop, Teutonic tone poems and abstract sound collages of ‘Radio-Activity’ were to prove influential. DAVID BOWIE had it as his pre-show music on the 1976 ‘Station To Station’ tour and it clearly laid some of the groundwork for his legendary ‘Low’ and ‘Heroes’ albums while later in 1983, NEW ORDER sampled ‘Uranium’ for ‘Blue Monday’. In that same year, OMD borrowed the concept for their now-highly regarded ‘Dazzle Ships’ album. 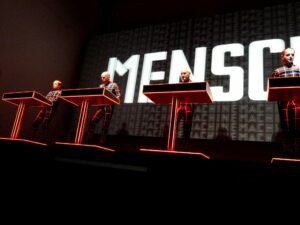 While the ideas were clearly replicating sections of ‘Radio-Activity’ (see ‘The Romance Of The Telescope’ for ‘Radioland’, ‘Radio Waves’ for ‘Airwaves’, ‘Time Zones’ for ‘News’, ‘Telegraph’ for ‘Antenna’ and ‘Radio Prague’ for ‘Intermission’), whereas KRAFTWERK’s gist had been in almost blind praise for technological enhancements and wider communication, OMD’s lyrical focus cast doubt, cynicism and fear. However, ‘Radio-Aktivität’ (or ‘Radio-Activity’) still remains an under rated triumph. 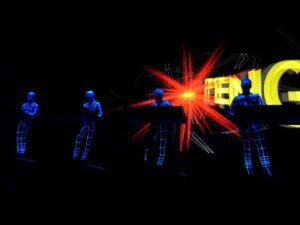 Other than the title track, very few of its songs are cited in most people’s KRAFTWERK Top 10. One case in point is ‘Ohm Sweet Ohm’. From its steady vocodered intro and classic drifting hook, it builds to a crescendo over the pulsing Minimoog bass and improvised virtuoso section to perhaps be one of the most beautiful pieces of music ever composed! ‘Airwaves’ and its whirring Odysseys over the frantic percussive backbone are a delight while the eerie chill of ‘Radioland’ is short wave experimentation at its best. 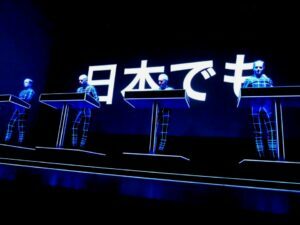 The last word has to go to KRAFTWERK’s remaining founder member. As the evening finished with the striking ‘Music Non Stop’, each member departed in turn following their section of improvisation. To sustained applause, the last man – Ralf Hütter – left the stage. His first and only words to the audience were “Bis morgen”. Or as they say in English “see you tomorrow”… the show will go on.